Established in 1960 Boyce & Co Packaging Ltd are a family run business specialising in printed packaging for retail businesses throughout the South West. Paper carriers are the most popular shop bag used by retailers and are the most eco-friendly bags on the market. 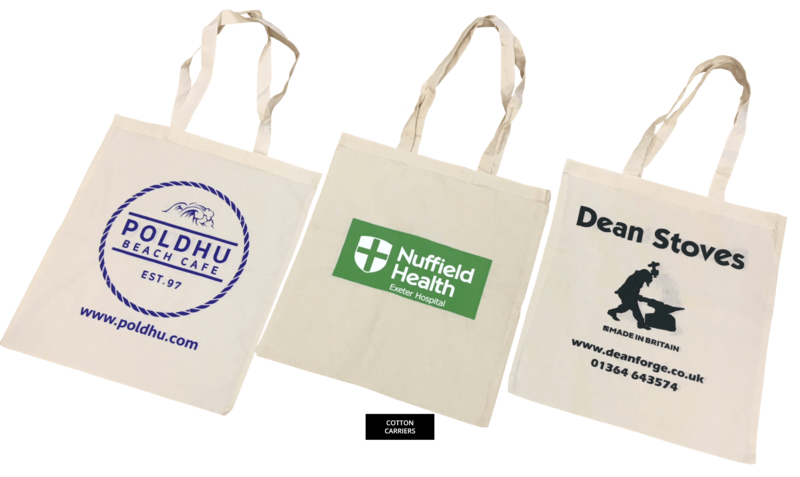 Available in different sizes with a choice of twisted paper handles or paper tape handles these bags are strong and made from recycled paper. Can offer small quantities starting at 500/1000 printed 1 colour. A low cost option used in most shops for over the counter items popular with gift shops and tourist attractions. Available in brown kraft, white sulphite, bleached kraft and white/brown grease resistant. 25,000 Minimum order. One of our most popular types of bags and available in different sizes and a choice of handle styles patch or varigauge. Minimum quantities starting at 1000 upwards. Of superior quality to the standard polythene carriers with a loop handle, many sizes colours available. Used mainly in retail outlets for clothes and shoes. This low cost vest carrier is available in various strengths can be printed in numerous colours, mostly Imported, offering a cheap strong option. Ethically sourced, and made from natural fibre this is a very popular type of bag offering a strong durable option. Biodegradable and supplied with soft webbing handles available in various sizes. Ethically sourced 100% natural cotton bags a popular alternative to the jute bags. Available in various sizes with long or short handles. An eco-friendly reusable bag, commonly referred to as a ‘Bag For Life’ these are a strong durable option available in many colours. These carriers offer a touch of real quality, bespoke and are made to size and are be supplied with rope handles. Can be printed all over including gussets and can have ribbon for that touch of extra class. Self-adhesive tape is the perfect way to identify your products. Available in Vinyl and Polypropylene quality in white, brown or clear, various widths printed up to 4 colours with a minimum order quantity of 72 rolls. These offer a secure branded solution to your despatch needs. Many sizes and colour options available. These are available in all shapes and sizes, and are custom made to your design requirements. Call us now and speak to a knowledgeable sales team member who will assist you with your printing needs. Copyright © Boyce & Co Packaging Ltd 2017. All Rights Reserved.